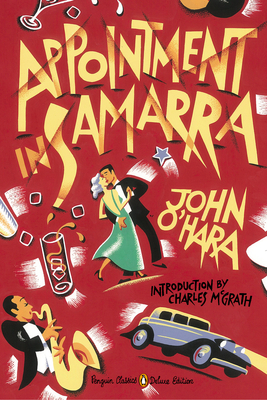 Someone at Penguin asked if I would like to review Appointment in Samarra by John O'Hara if they sent me a shiny (not actually shiny) copy, to which I internally said in a suspicious tone 'Whassthis?' And so TO GOOGLE I WENT, where I discovered that it is in fact a fairly well-known American novel from 1934. I will review all the fairly well-known American novels from 1934. The story's set in the semi-fictional town of Gibbsville, Pennsylvania (let it be known that O'Hara comes from a town called "Pottsville" in Pennsylvania) and concerns the "Lantenego Street set," which means the Richie Riches of Gibbsville — or more particularly, a man named Julian English, but the narrative bounces around a bit to other perspectives (all people, however, who know Julian English). The way I think of this book is like Fitzgerald, but a Fitzgerald where women are actually people and not a caricatured/poorly outlined/purposefully blurred set of dream girls whose raison d'être is to ensnare and/or torture young men who will spend their lives striving to keep said dream girls in fancy clothes and Persian cats or whatever the ladies are into nowadays. Tennis, probably. Those ladies and their tennis. 1. His characters are immensely recognizable as people you could actually meet in this world. I'm not saying it's not good to read a book with some elves and skippy fairy princesses, but if you're reading about a coal mining town called Gibbsville and a bunch of Cadillac salesmen, it's nice to see the people who live there as real people. He reached over and picked up the hat beside him, but his fingers rejected the dent in the crown, and he examined the hat. The brim did not snap down in front. It was a Stetson, and Julian wore Herbert Johnson hats from Brooks Brothers. But he did not like to see men driving hatless in closed cars; it was too much like the Jews in New York who ride in their town cars with the dome lights lit. 3. No one is actually demonized. Continuing with the 'women are people' thing, John O'Hara does what I've praised J.K. Rowling for before (primarily in The Casual Vacancy, but to a degree in Harry Potter as well) — he'll give you a perspective on someone and make you dislike them, but when you see that person from another angle, you understand that people are complicated. There isn't just "This person is terrible and this person is good." You have to understand their circumstances and their background and almost no one has time for that, so we just make snap judgments and everyone comes off the worse for it. I've read some controversial things about Appointment in Samarra being included on the Modern Library's Top 100 English Language Novels of the 20th Century list (...although really, I'd be hard-pressed to find even 100 for that, so I'm a bit confused as to the controversy). To whosoever thinks it's not good, I say you, sir, are a pernicious goatman who doesn't know good writing from that tin can you've been chewing on. Lastly, I must address the cover, which is both gorgeous and fun. With the advent of eBooks, publishers have been trying much harder to make their covers truly awesome, and Penguin is doing a bang-up job. Give me things that will look pretty on my shelves, book publishers! I absolutely judge things by their covers.